For their first tour in twenty years, these legends are performing at the absolute pinnacle of their game. Their rhythms are air-tight and their distinctive whirling guitar created epic tension and release moments that were exhilarating and spellbinding all at once. The band's ability for sonic excess was dealt out in calculated douses that kept the crowd on edge as the seams of songs were ripped open by shimmering guitars. Snare blasts were on point and the bass hummed keeping a tight lock on the grooves as the guitars expanded the heady melodies into further epic jams. The waves of sound notorious with this kind of music crashed over the vocals and burst into giant clouds of sparkling guitar tones. For a band so recently reunited, their precision was impeccable and not a glimmer of rust hung on to any moment. Perhaps their run of summer festivals still has them thinking they're combating giant open air fields because their sound was exploding inside the venue. "Catch the Breeze" kicked the show into high-gear with strobes adding to the sensory overload experience and other fan favorites "Blue Skied an' Clear" and "When the Sun Hits" received as much of a behemoth of a performance, cranking the power to new levels. "This is about as poppy as we get" claimed Rachel Goswell before the band sunk into "Alison", their masterwork of a single that beamed in from another galaxy. Walls of noise were built with immaculate layers of sound and texture. 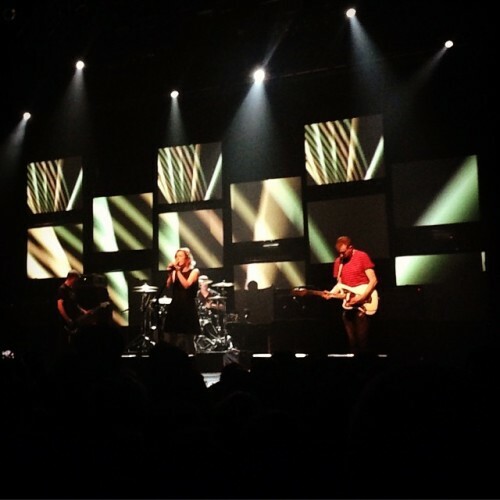 This show proved that Slowdive are masters of their craft and this tour is highlighting that their muscular guitar work can still be flexed along with the best. Their pristine performance (despite the disastrous Terminal 5) was truly remarkable and sight to behold. The dignified spectacle was anything and everything one could have hoped for after all these years of waiting. Closing with "40 Days", the band again broadened the scope of the song to allow for as much volume and spirit to embody the room as possible. When the notes finally rang out, the crowd walked away as if the dream had indeed come alive before their eyes.